The 350 PE Patchwork Edition is a sewing and quilting machine. The easy-to-attach extension table extends the sewing machine’s work area, ensuring better control over your sewing projects and a clear view of your fabric, even with larger sewing and quilting projects. 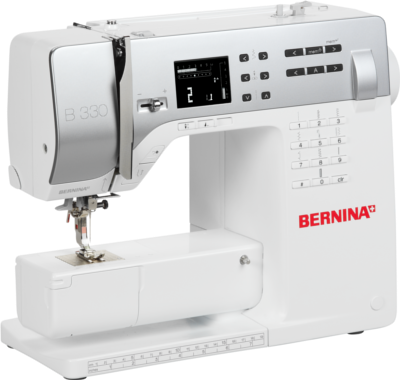 The BERNINA Free Hand System lets you leave your hands on your project while you raise the presser foot and lower the feed dog with the knee lever. The 191 built-in stitch patterns can be complemented by up to 30 of your own personal creative combinations or stitch settings, which can be stored in memory for instant access. The automatic buttonhole feature easily sews buttonholes to match the size of your buttons. A 1/4" foot and a walking foot are included with this machine. Length of freearm to the right of the needle: 6.25"
The 330 is a sewing and quilting machine. The easy-to-attach extension table extends the sewing machine’s work area, ensuring better control over your sewing projects and a clear view of your fabric, even with larger sewing and quilting projects. Its broad variety of stitches are an invitation to experiment, and you can create and store up to 30 attractive stitch combinations in the 330’s memory. This ensures that your favourite stitches are immediately available again at the press of a button. The automatic buttonhole feature easily sews buttonholes to match the size of your buttons. You can also add the optional BERNINA Free Hand System, to raise the presser foot and lower the feed dog while leaving your hands on your project.